Parker doesn’t want to talk about it. She’d just like to be left alone, to disappear, to be ignored. But her parents have placed her on suicide watch and her counselors are demanding the truth. Worse, there’s a nice guy falling in love with her and he’s making her feel things again when she’d really rather not be feeling anything at all. 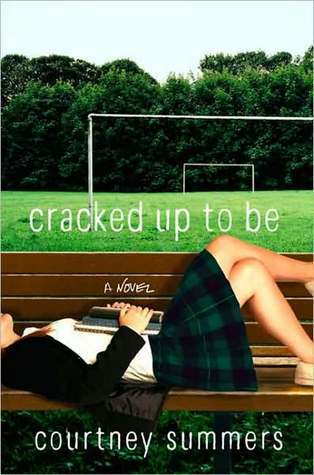 Cracked Up To Be is a book that I’ve wanted to read for a long time, and it’s a book I’ve had for a while, and it seemed like it was time to actually read it. Unfortunately, I didn’t like it. At all. On the surface, it does seem to be a book I’d like, but it didn’t work for me for several reasons. While I felt for Parker at times, and while I can relate to wanting to be perfect (before going in a self-destructive downward spiral), she was really hard to sympathsize with. She’s mean and pushes everyone away and goes on and on about how she doesn’t like or want to be around people and how she just wants everyone to leave her alone and is mad they won’t. For someone who wanted to disappear and blend in, she certainly did a horrible job of it. She was still the center of attention, and it kind of seemed like she secretly wanted all of the attention to be on her, even with how much she wanted to be ignored by everyone around her. I understand she’s punishing herself for what happened- at least, that’s how I took it- and she feels like everything in her life is bad. I understand it, and yet it made it hard to care. I felt like there wasn’t a lot to her character, and she definitely has a lot of things that she needs to work through. We do see the party that changed everything, and what led to her downward spiral was something that I never expected. I knew it was something, and even though it was unexpected, by the time we learn what Parker did, I had no interest in what she did. We slowly learn what happened by flashbacks, and that didn’t work for me at all. I listened to, and the transitions into/out of the flashbacks were clunky. With them, I didn’t even realize I was listening to the flashbacks until they were over. It just made things really confusing, because you’d get these random memories that didn’t fit with everything going on. I get why Chris still seemed to be into her- there is that history, but I could not get why Jake was into her, especially by the end of the book. After everything, he still wanted to be around her? I don’t get it. Another thing I didn’t like was how we didn’t see her life before the party. We get the idea, but for me, I think not seeing her “before” made it hard to care about what happened “after.” An after that she caused by what a horrible person she is. What we do see of her isn’t good. The only thing I did like was the narration! Hvam (who narrates part of the Beautiful Creatures/Dangerous Creatures series) can narrate the heck out of a teenage girl. Why have I not looked to see what else she’s narrated? Anyway, her narration was great. 1 star. Parker is such a horrible person, and it was hard to care about someone who tries to push everyone away, but also seeming to like the attention she got from people.